I didn’t know entirely what to expect when I went to see West End Players Guild’s production of The Hothouse. I knew this was Harold Pinter so I was expecting something unconventional, but knowing about Pinter and seeing one of his plays are different things (I had read some scenes from his plays but had never seen one performed). It’s also the first play I’ve seen from this company, and I have to say I’m impressed. This is the kind of play that I watch and then not just want to keep talking about on the way home, but for a while afterward. It sticks in a person’s head. It’s outrageously funny but also thought provoking and not a little bit disturbing. Also, in the hands of the excellent cast and creative team at West End Players Guild, it’s positively riveting from start to finish. The Hothouse is a black comedy revolving around the staff of an unspecified “government institution” in England in what appears to be the late 1950s (the play was written in 1958). It appears to be some kind of long-term care facility, and the patients are referred to by numbers rather than names. The staff members, from the institution’s director Roote (Robert Ashton), to his assistant Gibbs (Zach Wachter) and co-workers Lush (Roger Erb) and Miss Cutts (Elizabeth Graveman), all have their own agendas, and the unwitting and aptly named Lamb (Pete Winfrey) finds himself in the midst of their schemes. In a story that broadly and brutally satirizes institutional bureaucracy, there are many twists, turns and machinations as staff members seek to figure out what to do about the death of one patient and the unexpected childbirth of another. The plot unfolds from there and involves ambitious plotting, sexual politics, drunken bravado, violence, and absurdity, and it all takes place on Christmas Day. Pinter’s script is wordy, witty, and full of dynamic language and strong characterization, and it would be easy for a mediocre cast to get lost in all the dialogue, but fortunately that’s not the case here. The show is expertly paced and staged by director Suki Peters, and the cast is extremely strong. The standouts to me were Ashton as the pompous, forgetful and increasingly sinister Roote, Wachter as the stoic but scheming Gibbs, and Erb as the swaggering, confrontational Lush. 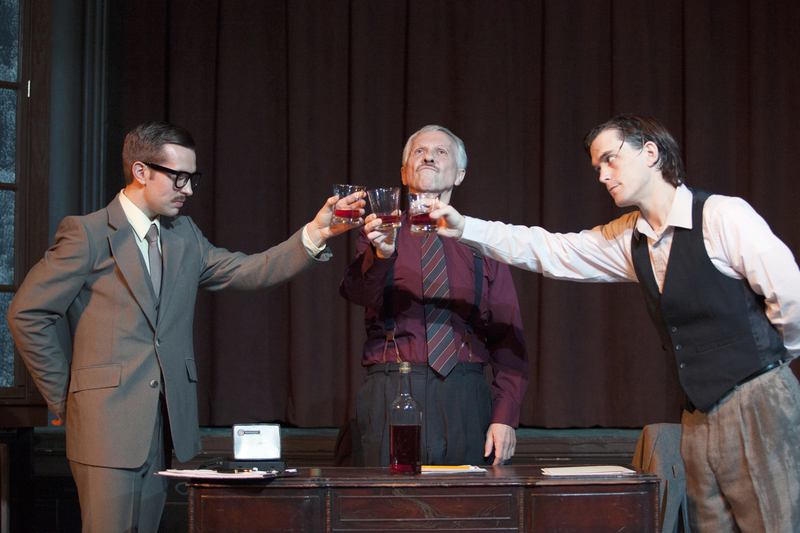 These three have a very memorable scene together involving lots of drinking, in which the tone gets increasingly antogonistic, with great wordplay by Pinter. Ashton and Wachter in particular have many excellent scenes together, starting from the opening, and it is their performances that anchor this production. Winfrey also makes a strong impression as the eager, clueless Lamb, and Graveman is effective as the lascivious Miss Cutts. 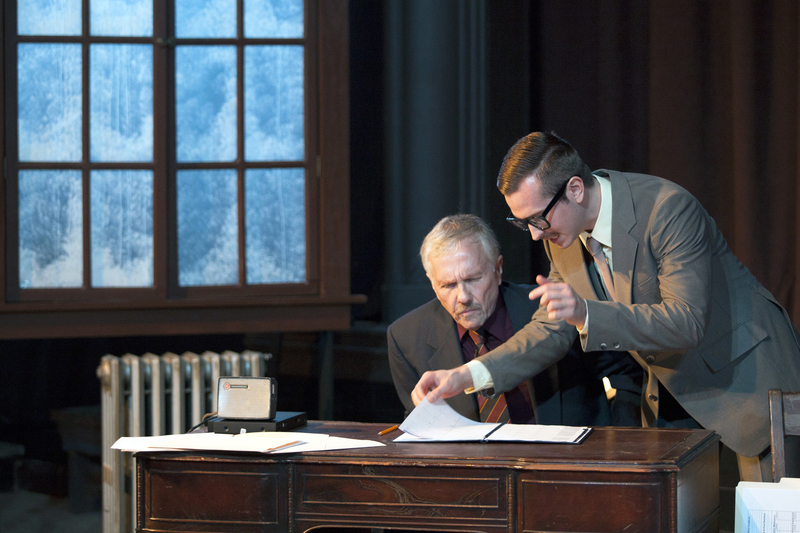 The set for this production (designed by Brian Peters) is inventively done, with the main setting of Roote’s office on the floor of the auditorium, with the stage behind it serving as various alternate locations, most notably the staff’s break room. Period music, sounding appropriately like old records played over a loudspeaker, adds to the 1950s atmosphere, as does the well-appointed set suggesting a cold, institutional setting. I also thought the lighting (designed by Nathan Schroeder) and sound (designed by Joshua Cook) added to the creepiness of some of the more absurd scenes, and particularly one at the end of the first act involving Gibbs, Miss Cutts and Lamb. The tone of this play ranges from silly to caustic to creepy moment by moment, and the look and sound of it added to the intensity of this production. This is one of those plays that makes the audience think as well as laugh. There are many laugh-out-loud moments as well as “what the hell?” moments as the comic and tragic elements of the play are so well realized. It’s a great script, yes, but it takes an excellent production to bring Pinter’s words to life, and this is a thoroughly well-done, fascinating production. I was very impressed by West End Players Guild, and I look forward to seeing more of their productions in the future.